So my birthday isn’t until late July, but today would have been my big brother’s birthday. His name was Julian and he passed away several years ago. He was tall and handsome. He was shy and kind. He was incredibly smart and very talented. He played guitar and piano. He would listen to Led Zeppelin, Metallica, Tool, The Stanley Brothers, Muddy Waters, Bad Brains, Patsy Cline, Rakim, and Beethoven in one sitting. He was cool like that. He hated peas and he was a closet Star Trek fan. He was a nerd like that. Anyway, I wanted to share this with you all because knowing and loving Julian motivated me to be a writer. My writing is what connects me to him, and you to me. In honor of Julian’s birthday, I decided to share a recipe for a birthday cake I know he would have loved. Happy Birthday, Julian!!! In a stand mixer, cream butter and sugar for 3 minutes, longer if the color and consistency are not completely uniform. Scrape down the sides of the bowl and add all three eggs at once. Mix for an additional 3 minutes, making sure everything is well mixed, then scrape down the sides of the bowl again. Preheat oven to 350F. In a small bowl, whisk together buttermilk, vanilla and oil. Turn on mixer to the lowest speed and slowly stream the liquid mixture into the bowl. Once it’s completely added, turn mixer up to medium-high speed and let mix for 4 minutes. Scrape down the sides and repeat. Two times mixing and scraping, should be enough but sometimes an additional 2-3 minutes is needed to ensure that the liquids are homogeneously mixed. In a separate bowl, mix flour, baking soda, salt and sprinkles together. Add the mixed dry ingredients all at once to the wet ingredients in the mixer and mix on low speed no longer than a minute, just long enough to bring ingredients together and ensure there are no dry bits or streaks. Spray a 11”x13″ inch pan with oil and line with parchment paper. Pour the batter into the pan and bake for 32-35 minutes at 350F. Make sure that edges of cake are browned and center is firm before removing from oven. To test for doneness, pull the pan out of the oven and listen to the cake. If you don’t hear any bubbling, that means the batter is completely cooked. If you hear a slight bubbling sound, return to cake to the oven for 2-3 minutes. Watch it carefully to make sure it doesn’t burn! Once removed from oven place cake pan on a cooling rack until cake is cool enough to construct cake. Place butter and cream cheese in the bowl of a stand mixer and blend on medium-high for 2-3 minutes. Scrape down the sides of bowl, add powdered sugar and mix on medium high. While this is mixing add salt, lemon juice, and baking powder to the bowl, mix for 30 seconds, then scrape down sides. 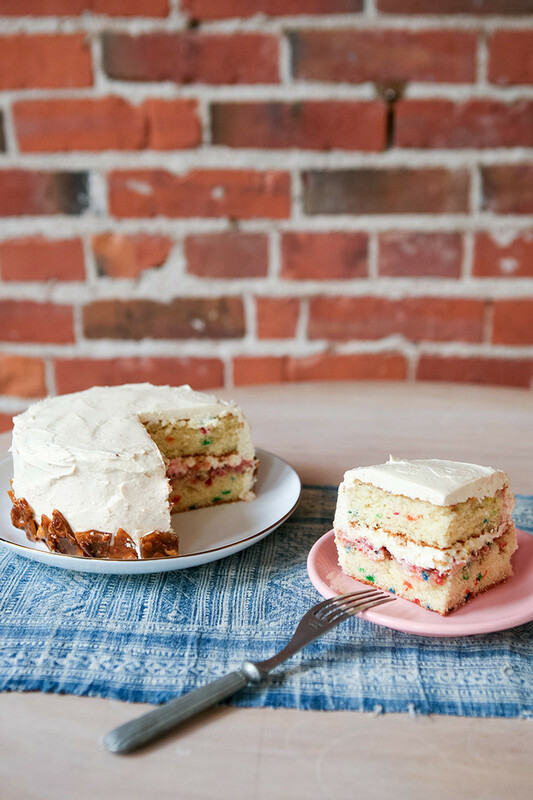 Mix frosting an additional minute, then transfer to an air-tight storage container and refrigerate for up to a week. Allow the chilled frosting to sit at room temperature for 30-45 minutes before trying to spread it on the cake. Place the almonds inside a small paper bag and fold the top of the bag over a couple of times to keep the almonds inside. Lay the bag on its side on the counter and, using a rolling pin, roll over the bag to break the almonds into small pieces. Set aside. In a medium sauce pan, heat sugar over medium high, whisking constantly. Bring sugar to almost a boil and as soon as the color starts to turn brown remove the pan from heat. Add almonds to the melted sugar in the pan and whisk to combine. Pour this mixture onto a silicone lined baking sheet. Using a heatproof spatula, spread it out out evenly into a thin layer, working quickly before the brittle hardens too much. It will be extremely hot; do not touch it with your bare hands! Cool completely, for about 1-1 1/2 hours, then break brittle into small 1/4 inch sized pieces, saving some larger 1-inch sized pieces to decorate the outside of cake. Place strawberries into a strainer to thaw and allow all juices to drip away. Purée berries in a blender or cuisinart and store in an air tight container refrigerator for up to 3 days. Using a 6-inch pie pan as a pattern, place it on top the cooled sheet cake and cut around it to make two circles of cake. Place one of them the plate you’ll be serving the cake on. Pour strawberry purée onto the center of the cake round and spread it evenly, right up to the edge. Sprinkle the 1/4-inch brittle pieces over the purée. Frost the second cake round with the cream-cheese frosting and carefully place it, frosted side down, on on top of brittle-purée covered cake round. 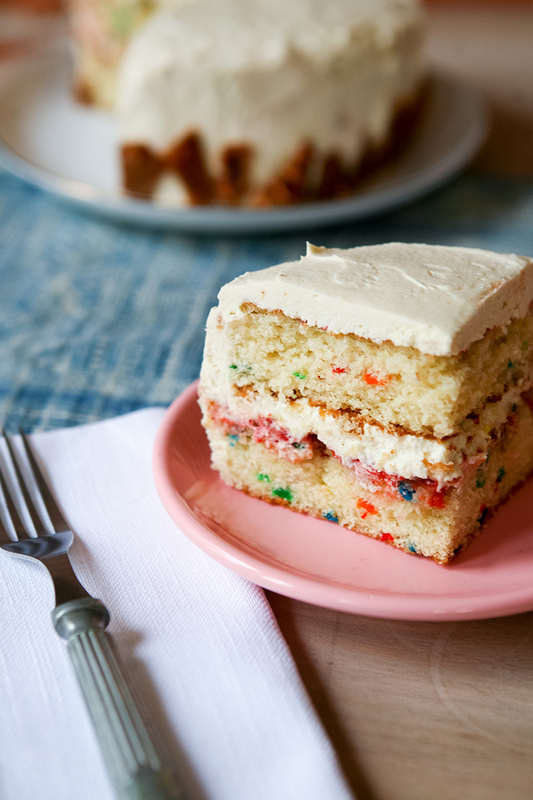 Now frost the entire cake with all of the frosting you have left. Don’t worry about strawberry purée mixing in with frosting; just smooth a little more frosting over it and enjoy the nice pink color as it mixes. Place larger brittle pieces around the bottom of the cake. 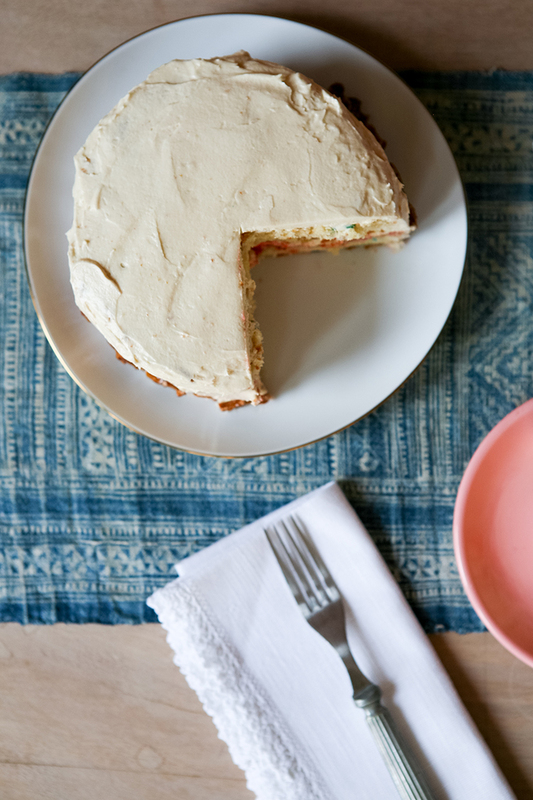 This cake tastes best if it has been frozen for at least 2-3 hours or preferably overnight. To freeze the cake, cut a piece of wax paper large enough to wrap around the cake with some extra room to overlap. Wrap the paper around the cake and tie it place with string. Don’t worry if it sticks to the frosting a little; it will pull off easily when the cake is frozen. Keep the cake in the freezer for up to 3 days before serving. Immediately after removing the cake from the freezer, unwrap the wax paper gently and allow the cake to come to room temperature for a least 2 hours before slicing, for maximum flavor and moistness.